Looking for work? 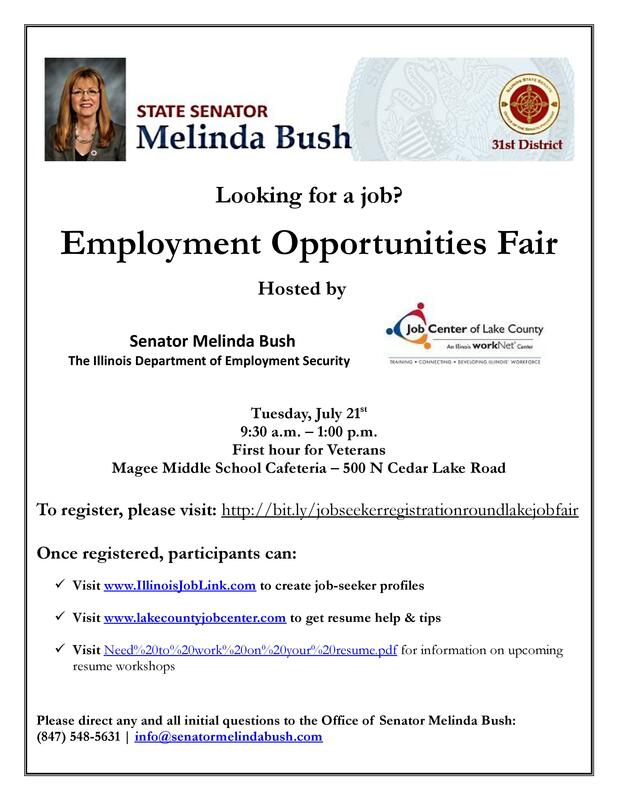 Bring your resume to a job fair in Round Lake, sponsored by the Illinois Department of Employment Security. Join us at Magee Middle School, 500 N. Cedar Lake Road in Round Lake from 9:30 a.m. - 1 p.m. The first hour will cater specially to veterans. In a ceremony that saw traffic on the busy roadway slowing down to pass just feet from the gathering near John Mogg Drive, Joey Dimock was remembered as a fun-loving boy who grew into a focused and accomplished young man. "Spc. Dimock was not only an American hero, but he was dedicated to his faith and his community. Joey's service to the Wildwood Presbyterian Church was admirable for such a young man," said John Christian, chief of the Grayslake Fire Protection District, who has known Ellen Dimock and her family since she joined the district's board of trustees in 1999. "I can say without any doubt that Joey was a well-rounded young man that left us way too early in life. I am still in awe of all that he accomplished in his short life," added Christian, noting that Dimock became an Eagle Scout with Wildwood-based Boy Scout Troop 672, graduated from Army Ranger school and served three tours in Afghanistan. Dimock has been honored previously in the area with the naming of an exercise facility at Grayslake Fire Station 3 in 2010 and the dedication of a memorial at Wildwood's Willow Point Beach in October 2011. Ellen Dimock said Friday's honor was the result of a 2014 chance meeting with state Sen. Melinda Bush, D-Grayslake, and a discussion about what could be done to commemorate his life. "She knew of my loss," Dimock added, "and as we began to talk, we ended up in tears. As we said our goodbyes for the day, she said she would look into it and get back to me. And here we are today." Bush was accompanied at the ceremony by state Rep. Sam Yingling, D-Grayslake, who joined her in sponsoring the measure to dedicate the roadway. Bush also recalled the conversation with Dimock and how "she told me about the life (Joey Dimock) had lived and the work that he did." "I learned pretty quickly about the strength of Ellen Dimock and her family and the love that she has for this community, this country and this world," added Bush, who asked the gathering to join her in a moment of silence before presenting the Dimock family with copies of the formal resolution dedicating the section of Route 120. Just before state workers unveiled the roadside sign, Ellen Dimock said Friday's experience was one of many that gives her strength "short of having my son with me" as the years pass. "We are given opportunities to share with you our story," she told the crowd, "and in doing so, Joey is with us. He is always with us." Read the full story at the Lake County News-Sun. As a state budget stalemate continues at the Capitol, State Senator Melinda Bush announced she will forgo her pay as a lawmaker if state workers go without paychecks beginning next week. Gov. Bruce Rauner recently used his veto powers to eliminate state worker pay and nearly every other part of the state budget that lawmakers approved in May. If some resolution isn’t reached soon, state workers could begin going without pay beginning next week. If that happens, Bush would voluntarily go without pay. She has filled out the necessary paperwork to file with the state comptroller to ensure paychecks would not be deposited. With Bush’s support, the Illinois Senate approved an emergency, one-month budget last week that would ensure vital public safety personnel ranging from Illinois State Police to the Illinois National Guard are paid. The Senate will return to session next week to potentially take additional action on a state budget plan. SPRINGFIELD — Arguing in favor of emergency funds that would keep vital state services in place during ongoing 2016 budget negotiations, State Sen. Melinda Bush called on GOP Senators and Gov. Bruce Rauner to support a one-month provisional spending plan equal to about 2 percent of the state budget Wednesday. Senator Bush voted for a one-month provisionary budget that would have ensured ongoing services as lawmakers continue to negotiate a full 2016 budget. 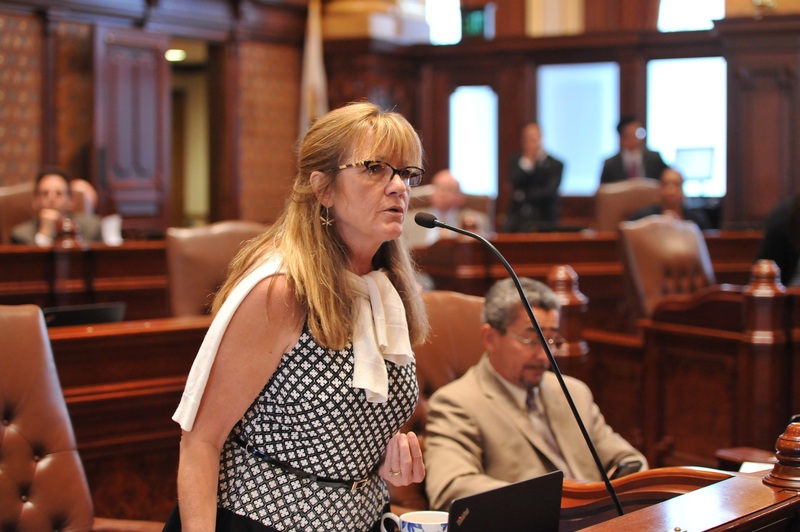 The measure passed the Illinois Senate without Republican support. It proceeds to the House for consideration.